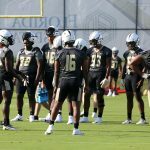 UCF players stretch before the first practice of fall camp Wed. Aug 1st. 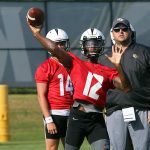 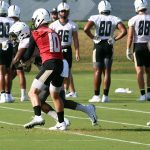 WR Tristan Payton warms up before UCF’s first practice of fall camp. 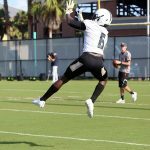 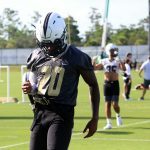 DB Nevelle Clarke warms up before UCF’s first practice of fall begins. 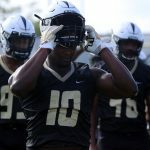 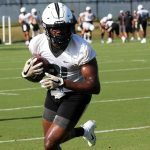 RB Greg McCrae prepares to warm up for UCF’s first practice this fall. 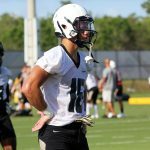 WR Gabe Davis stretches before the start of UCF’s first fall camp practice. 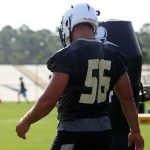 UCF players warm up for the first practice of fall camp. 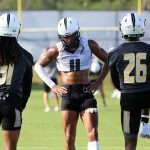 (from left to right) DB Aaron Robinson, WR Cam Stewart, and Jermaine McMilian warm up before UCF’s first practice of fall camp. 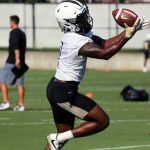 RB/WR Otis Anderson lines up for a drill. 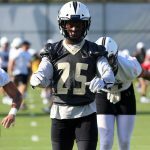 DB Antwan Collier warms up for the first practice of fall camp. 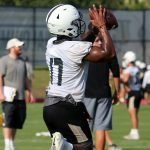 RB Adrian Killins Jr. stretches before the start of UCF’s first practice of fall camp. 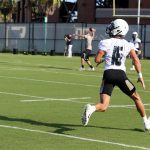 DB Kyle Gibson warms up before the start of fall camp. 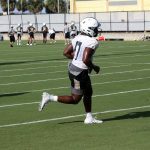 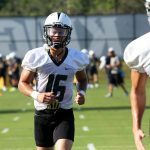 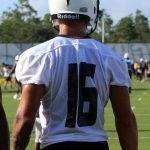 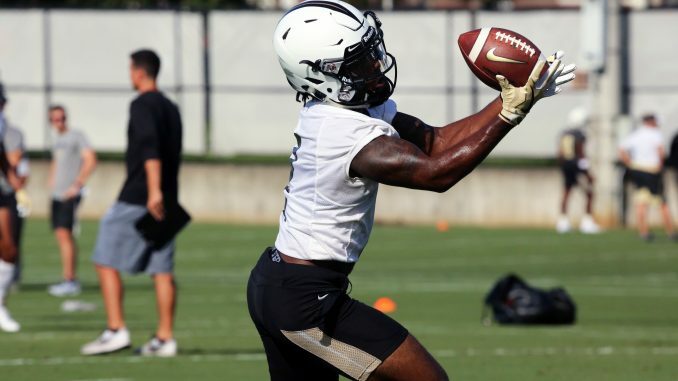 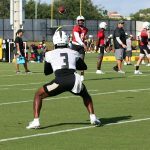 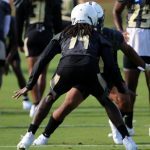 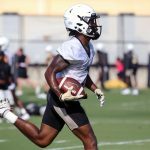 WRs run reps during UCF’s first practice of fall camp. 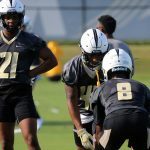 UCF players await instructions at the start of the first practice of fall camp. 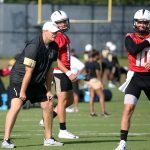 UCF players await instructions during the first practice of fall camp. 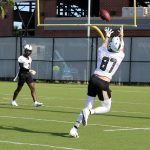 WRs run through drills during the first practice of fall camp Wed.
WR Jaquarius Bargnare makes a catch. 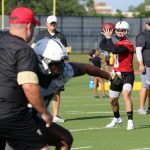 Coach Josh Heupel overlooks his QBs during practice. 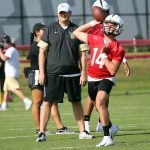 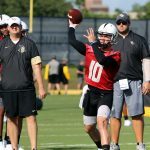 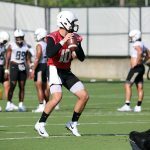 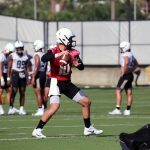 QB McKenzie Milton makes a throw. 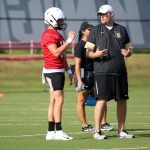 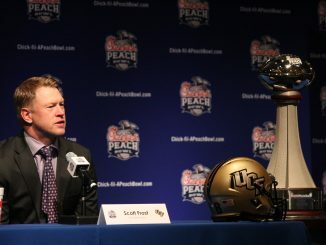 Coach Heupel talks with QB Hayden Kingston. 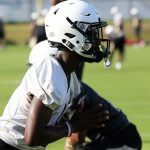 DB Zamari Maxwell faces off with a teammate. 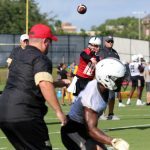 DB Rahsaan Lewis faces off with a teammate. 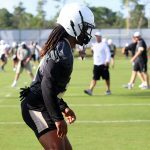 DB Nevelle Clarke faces off with a teammate. 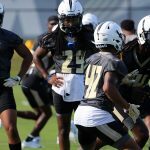 DB Rashard Causey (21) faces off with a teammate. 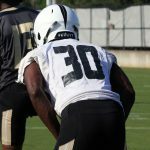 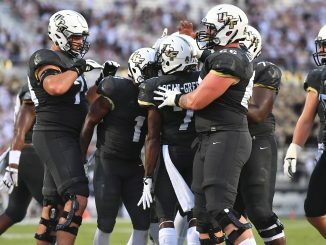 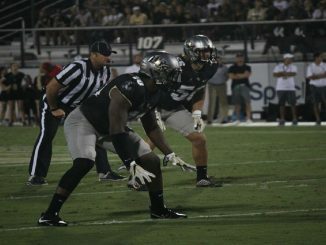 UCF LBs take part in drills during the first practice of fall camp.